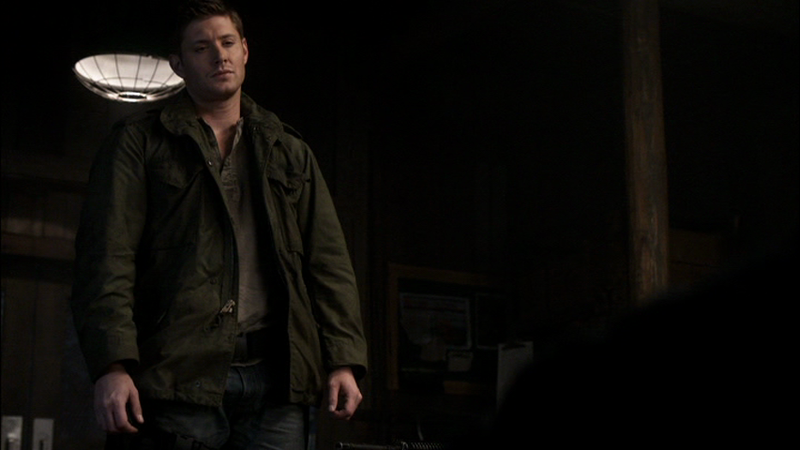 Dean's Green Utility Coat of Doom! 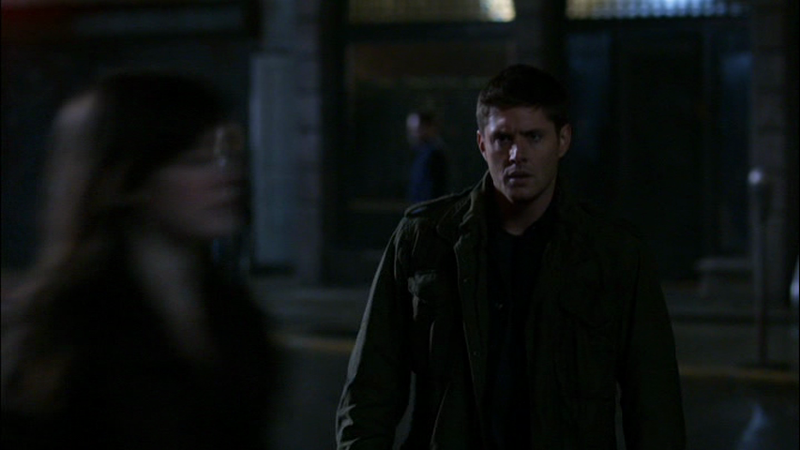 We first see this coat in The End (5x04), when Future!Dean is wearing it. Dean himself doesn’t pick it up until later in S5. It may, in fact, belong to Bobby, as Dean finds it in Bobby’s basement after he escapes from the panic room. It’s a green utility coat with a military feel to it. It has two very large breast pockets, and hidden side pockets. Brand Information: Alpha Industries M-65 (unmodified). In The End (5x04), Future!Dean wears it for the entire episode. In Point of No Return (5x18), Dean finds it in Bobby’s basement after he escapes from the panic room. He wears it until Castiel beats him up and brings him back to Bobby’s. Sam (I’m assuming), removes it at some point while transporting the unconscious Dean from Bobby’s bed in the living room to the cot in the panic room, because he wakes up without it on. FATE: If the coat did belong to Bobby, then it may have burned along with Bobby's house in Hello, Cruel World (7x02). And yes, I'm pretty sure Bobby would be like "He's your brother, YOU carry him!...and give me back my coat!" Adore this jacket, simply because green looks fantastic on Dean(and Jensen). And it's really pretty to color when making graphics, lol. I agree! - well, about the looking-good-on-Jensen part. I don't know anything about making graphics. Hmm, good point! It's a possibility anyway. The henley future Dean is wearing is that his grey henley or another one? Henley's are kind of hard to tell apart, since really, Dean could be wearing ANY green henley at any given time. It's why my henley categories are kind of a "catch all" rather than referring to one specific article of clothing. You'll notice the "grey henley" entry I specify in each "appearance" whether the henley is light or dark grey...and then there's shorter necked ones and longer necked ones, and I just didn't have the patience to try to tell them all apart. Which is the long answer to the short answer: I don't know. You'll have to do a comparison and see what you think.